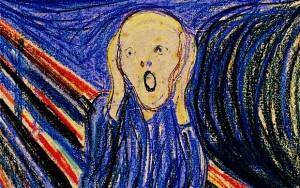 Finding out that you are to give a speech or talk may very well compel you to do your best Scream impression. And why wouldn't it? Getting in front of people and saying something that keeps them engaged is a particularly scary thing to do. What if you leave a crucial part out of the talk? What if you forget to pack your slide show clicker thing? What if you bore them to tears? The truth is, the best way to overcome the anxiety of a presentation is to be confident in the content you are to present to them. With confidence in your content, you'll have confidence in, well, everything else. Indeed, you may very well leave something out. You could definitely forget to pack one of your many devices. But the truth is, you are not in any danger of boring anyone to tears or doing anything else that falls short of your audience's expectations if you take the time to distill your talk down to an essential idea and then engineer the various stories, facts, and everything else that makes up your content as an extension of that idea. This can be a tricky thing to do. Do let me know if you're about to give a talk, and I'll be happy to speak with you about how you can ensure that people will be held rapt at attention from the very first moment you speak.